Starting seeds indoors ahead of time may seem like a great idea, but some plants don’t transplant well and should be direct sown. There are many reasons to sow seeds directly into the garden in spring. Some seedlings simply don’t like to be transplanted and the stress may be too much for them to survive. There are annuals, perennials and vegetables that grow very quickly and easily from seed, so seeding directly into the garden in spring can save you a lot of money and time. Also consider that an indoor environment is not ideal for seedlings, so even if you do sprout them indoors you may want to get them outside as quickly as possible to encourage stronger and healthier plants. So, now how do you decide what to direct sow? Start by selecting plants whose seeds have a high germination rate and that have a fast growth rate. Although I know from experience that a plant that was direct sown usually catches up in size to a transplant very quickly. Shortly into the growing season you usually cannot tell which plants were direct sown and which were transplants. It is important to follow the guidance on seed packages regarding when to plant the seeds. Tender plants that germinate early may be killed by frost. Wait until the soil is warm enough, you will know the soil is good and warm when you see the weeds sprout. Pay attention to the weather so you can plan to plant your seeds when soil is moist and crumbly, not dry or wet. And you will want to avoid planting just before heavy rain is expected, which will wash out and displace the seeds You can prepare your beds and soil well ahead of time so that you are able to plant when the weather is right. Then be sure to follow the directions for planting depth carefully so your seeds germinate easily. Keep the soil moist after seeding by very lightly misting the bed to prevent washing out soil and displacing seeds. You may even want to just use a spray bottle to keep the mist gentle. Plant your seeds in nice loose soil so you can easily plant and cover as directed and to encourage quick rooting. Many annuals and some perennials prefer soil that is not too fertile or down right poor, so select plants appropriate for your soil or amend your soil. For vegetables the soil should be prepared with good compost and soil amendments or at least with a starter fertilizer with low nitrogen, 5-10-10 is a good starter ratio. Vegetable seeds are typically sown in a furrow or straight line created by running a stake or the point of a cultivator in a line in the soil to the appropriate depth. Then just gently push the furrowed soil back into the planting line. Large seeds can simply be pushed individually into the soil to the required depth. Very tiny seeds generally need to be left at or very near the surface of the soil - you can just sprinkle soil over them once laid out in the garden bed. Planting in rows will make weeding and cultivating easier. Certain flowers you might prefer to sprinkle randomly. Gardeners sometimes start seeds indoors to avoid some of the problems that seedlings encounter outdoors. Cold nights can be a problem for some young seedlings, so be sure to plant at the appropriate time, as directed on the seed pack. Seedlings may occasionally be damaged or even eaten by birds, snails, slugs, or other little critters. Heavy rain or wind can also damage seedlings. If you have these problems in your gardens you may want to use a seed blanket (available at garden centers) to protect them. A seed blanket, which is a very thin fabric like sheet that can lay directly on the soil, will also help retain warmth and moisture for your seeds, and eliminate soil splash and runoff. I use a variety of recycled items that I start saving in late winter to protect or cover seedlings and small transplants. Small mesh type baskets from cherry tomatoes are perfect inverted over the seedling and pressed lightly into the soil. 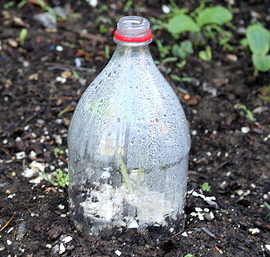 Clear deli and fruit containers or cut off milk jugs with holes punched in them for venting act like a cloche, protecting seedlings from wind, rain, insects, and critters while also trapping warmth. Sluggo can help take care of slugs and snails. Agrostemma githago seeds should be planted 1/8” deep and should sprout in 1-2 weeks. Agrostemma are frost hardy and can even be sown in winter in warm regions. Bachelor’s Button grows easily from seed and should sprout in 1-3 weeks. Plant 1/8” deep. Bachelor Buttons will germinate in cool soil and are frost hardy so they can be planted well ahead of the last frost. Calendula seeds should be sprinkled on the soil surface and lightly covered with soil. The seeds should sprout in less than 2 weeks. Calendula are frost hardy and can even be sown in winter in warm regions. Castor Bean seeds should be soaked in water for 12-24 hours before planting. Plant the seeds 1/2” deep after the last frost. The seeds should sprout in 1-3 weeks. Celosia seeds should be planted about two weeks after the last frost. The seeds can be sprinkled on the soil surface and pressed lightly into the soil. The seeds will sprout very quickly. Cleome can be sprinkled on the soil surface. The seeds sprout in 1-2 weeks but can be slow growers. Cleome are frost hardy so they can be sown well ahead of the last frost to compensate for their slower growth rate. Cornflower seeds can be planted as soon as the soil is workable, the seedlings are frost hardy. In warm regions that can be planted in September to bloom in spring. Plant the seeds 1/2” deep, they will sprout in 7-10 days. Cosmos should be sprinkled on the soil and very lightly cover with soil. The seeds sprout in 1-2 weeks. Cosmos seeds can be sown early and the seeds will sprout as soon as conditions are right. Flax Linum grandiflorum are frost hardy and can even be sown in winter in warm regions. In cold regions plant seeds as soon as the soil is workable about 1/4-1/2” deep. Hyacinth Bean Vine should be planted 1/4 inch deep. First soak the seeds in water for 12 hours then nick the seed’s tough shell. The seeds sprout in 1-2 weeks. Impatiens prefer a very warm soil to germinate so wait until the soil is very warm, 75 degrees. Cold regions will have some difficulty seeding so late and getting blooms before July. The seeds can be sprinkled on the soil surface and pressed lightly into the soil, they should sprout in 5-7 days.. Do not buy pellet seeds, it will slow germination substantially. Larkspur are a cool season plant and the seeds can be sprinkled on the soil surface very early in spring. The seeds will sprout in 3-4 weeks. Larkspur are frost hardy and can even be sown in winter in warm regions. Love-in-a-Mist are frost hardy and can even be sown in winter in warm regions. Sprinkle the seeds on the soil surface a couple of weeks before the last frost and cover lightly with soil. The seeds will sprout in about 2 weeks. Marigold seeds sprout in a week or less. After the last frost plant seeds 1/8” deep. French varieties of marigold are the easiest to grow from seed. Moon Flower Moon Flowers do not transplant well so they are ideal for direct sowing. Nick the seeds (use a nail clipper or razor blade) and then soak in water overnight before planting. Plant the seeds 2 weeks after the last frost if the soil is warm. Morning Glory seeds should be soaked in water for 12-24 hours, then nick the tough seed shell (use a nail clipper of razor blade). Plant 1/4” deep. The seeds sprout in about a week. Morning Glory don’t transplant well, so are ideal for direct sowing. Moss Rose seeds should be planted 1/8” deep after the last frost. The seeds sprout in 2-3 weeks. Nasturtium seeds should be soaked in water for 12-24 hours, then nick the tough seed shell before planting (use a nail clipper or razor blade). Plant 1/2” deep. The seeds will sprout in about a week. Nasturtium do not transplant well so they are ideal for direct sowing. Poppy Poppies are frost hardy (except California Poppy) and can even be sown in winter in warm regions. In cold regions seeds may be sprinkled on the soil surface as soon as the snow is melted, no need to cover them with soil. Poppy do not transplant well so they are ideal for direct sowing. Snapdragon are frost hardy and the seeds will germinate in cool soil, so they can be planted well ahead of the last frost. Sprinkle the seeds on the soil surface and press lightly in to the soil. The seeds should sprout in about 2 weeks. Sunflower do not like being transplanted, so place the seeds where you want them to stay. Sprinkle the seeds on the soil surface and cover lightly with soil. Seeds will sprout in about a week. Sweet Alyssum seeds can be sprinkled on the soil surface and pressed lightly into the soil. The seeds will sprout in 4-7 days. Sweet Pea Sweet Peas germinate well in cool soil and are frost hardy so they may be planted very early. Nick the seeds before planting (use a nail clipper or razor blade) and plant 1/2” deep. The seeds will sprout in about 2 weeks. Zinnia seeds should be planted 1/8” deep only after overnight temperatures reach 60 degrees consistently. The seeds will sprout in less than a week. Allium seeds (bulbs) should be planted 4-5” deep in late fall. Seeds sown in spring may not sprout until the following spring. Bee Balm Monarda seeds germinate best with cold stratification, so plant them in late fall to sprout in spring. If you plant in spring, plant the seeds about 2 weeks before the last frost so the seeds are exposed to cold nights. Sprinkle on soil surface and cover lightly with soil. Seeds planted in very early spring will usually sprout in about 3 weeks. Black Eyed Susan Rudbeckia seeds need cold stratification for best germination, so plant them in late fall to sprout in spring. Sprinkle seeds on the soil surface and do not cover. Seeds will sprout in in 7-14 days if planted in very early spring. Columbine Aquilegia seed need cold stratification and should be sown in late fall or 6-8 weeks before the last frost and absolutely must be fresh seed. Sprinkle the seeds on the soil surface and do not cover with soil. If planted in very early spring the seeds will germinate in 21-25 days. Coreopsis seeds need cold stratification and should be sown in late fall to sprout in spring. Plant the seeds about 1/4” deep. If sown in very early spring the seeds should sprout in about 3 weeks. Dianthus of all varieties grow easily from seed. Plant the seeds about 1/8” deep after the last frost. The seeds will germinate in 2-3 weeks. Foxglove Digitalis (a bienniel) seeds need cold stratification for best germination and should be sown in late fall to sprout in spring. Sprinkle the seeds on the soil surface and press lightly into the soil. If sown in very early spring the seeds will sprout in 3-4 weeks. Globe Thistle Echinops seeds need cold stratification for best germination and should be sown in late fall to sprout in spring. Sprinkle seeds on the soil surface and press lightly into the soil. Seeds planted in early spring will germinate in 2-3 weeks. Hollyhock seeds need cold stratification for best germination and should be sown in late fall to sprout in spring. Seeds can be planted 6-8 weeks before the last spring frost, or as soon as the snow has melted. Plant seeds 1/4” deep, they will sprout when the soil is good and warm..
Ice Plant seeds should be planted only after all danger of frost has passed. The seeds will sprout very quickly and be ready to bloom in a few months. Be sure to purchase hardy Ice Plants that will survive the coming winter once established. Lupine don’t always make it through winter, but will grow easily from seed. Soak the seeds for 12-24 hours then nick the tough seed shell before planting. Plant lupine seeds in late fall or as soon as the snow has melted in spring. Sprinkle the seeds on the soil surface and press lightly into the soil. Penstemon seeds should be sown in late fall to sprout the following spring. Sprinkle the seeds on the soil surface and do not cover. The seeds will germinate in 10-30 days once the soil warms, depending on the variety. Poppy (perennial) need cold stratification and should be sown in late fall to sprout in spring. Northern regions can plant poppy seeds after the snow has melted, poppy seeds will germinate at about 55 degrees. Sprinkle the seeds on the soil surface and press lightly into the soil. Primrose (primula sieboldii spp.) seeds should be sown in late fall to complete a freeze cycle. The seeds sprout easily the next spring, but the plants themselves are sometimes finicky growers. Sprinkle seeds on the soil surface and press cover lightly with soil. Purple Coneflower seeds need cold stratification, so plant them in late fall to sprout in spring. Plant the seeds 1/8” deep. Shasta Daisy seeds can be planted in late fall or just after the last frost has passed in spring. Sprinkle seeds on the soil surface and press lightly into the soil. Seeds should sprout in 10-20 days. Yarrow achillea seeds can be planted after the last frost. Sprinkle the seeds on the soil surface and press lightly into the soil. The seeds should sprout in 2-3 weeks. Basil seeds should be planted after the last frost date when the soil is warm. The seeds should be planted 1/4” deep and will sprout in just a few days. Beets prefer growing in cool soil so they are perfect to be started early outdoors. Seeds can be planted 2-4 weeks before the last spring frost. Follow package planting directions for root bulbs or early beets. Beans are probably the easiest vegetable to grow from seed. The seeds should be planted about an inch deep after the last frost. Soaking the large seeds in water for 24 hours will almost guarantee quick germination of every seed. Canteloupe seeds should be planted about 1/2” deep after the last frost. Canteloupe do not transplant well so they are ideal for direct sowing. Carrot seeds can be planted a week or two before the last frost. Seeds should be planted about 1/4” deep. Chard Soaking the seeds in water for 1-24 hours will almost guarantee quick germination of every seed. Plant the seeds about 1/2” deep a week or two before the last frost. Chervil seeds can be planted three or four weeks before the last frost, plant again in late summer. Plant the seeds about 1/8” deep, they will sprout in 2-3 weeks. Cilantro (Coriander) seeds can be sown a week or two before the last frost date. Plant the seeds 1/8” deep, they will sprout in 2-3 weeks. This is a cool season plant that will deteriorate in the heat of summer, so plan to sow again in late summer for a fall crop. Corn seeds should be planted a week after the last frost when the soil is very warm. Plant corn seeds 1” deep and 10-12” apart. Find an early to mature variety in cold climates as corn typically needs a long growing season. You will need at least 12 plants in a block of short rows for proper pollination. Cucumber seeds should be planted 1/2” deep after the last frost. Soaking the seeds in water for 24 hours will almost guarantee quick germination of every seed. Cucumbers do not transplant well so they are ideal for direct sowing. Dill can be planted four or five weeks before the last frost. Plant the seeds 1/4-1/2” deep. Lettuce seeds can be sown a week or two before the last frost date and will sprout in 1-2 weeks. Plant the seeds 1/4” deep. Lettuce will be ready for harvest quickly so plant small batches every 2-3 weeks. This cool season crop will not do well in the heat of summer. Head lettuce are the most difficult to grow, choose loose leaf, romaine or butterhead bibbs. Onion seeds should be planted 1/4” deep after the last frost, they should germinate in about a week. Onions have a long growing season, so in cold regions with short summers find a variety that matures quickly. Peas can be sown about two weeks before the last frost date. Plant the seeds 1” deep and 2” apart. Radish seeds sprout in a few to several days and are ready to eat in 3-5 weeks. Then plant another round of seeds or plant another row every couple of weeks for continuous harvest. This cool season crop will not do well in the heat of summer so plant your first crop about 2 weeks before the last frost date. Squash seeds should be planted 1/2” deep after the last frost. Squash do not transplant well so they are ideal for direct sowing. Turnip seeds can be planted 3 weeks before the last frost. Plant the seeds 1/4” deep, they should sprout in 1-2 weeks. Watermelon seeds should be planted 1” deep after the last frost. Watermelon do not transplant well so they are ideal for direct sowing. Watermelon has a long growing season so in the north with short summers, select a variety with a short maturity. Space your seeds out according to package directions as best you can. It is difficult to control placement with small seeds and you may drop too many seeds. Over planting is better than under planting, you can thin the seedlings if you have too many. When thinning, try to pull out seedlings that appear the weakest, leaving the strong seedlings plenty of room. Cool season plants can usually be sown in late April in the North zones 4 and 5, sooner in warmer regions. Just know your average last frost date and plant 2-3 weeks before that date. Warm Season plants can usually be sown in late May or early June in northern zones 4 and 5, but planting dates can vary by plant type. Generally warm season plants can be seeded as soon as the last frost date has passed. Seeds that need cold stratification to break dormancy should be planted in the fall. Plant them right around the average first frost date. Mulch over the seeds to prevent heavy rains or freeze thaw cycles from displacing them. Be sure and mark your plantings so you remember where they are in spring. It would be a shame to mistake them for weeds and pull them up (yes, I have done just that!). There are other ways of preparing the seeds, but I prefer to just go with Mother Nature, it is the easiest anyway. Don’t be afraid to grow plants from seed just because they are not listed as “easy to grow from seed”. All plants will grow from seed, some are just a bit more finicky about the conditions for germination. Do a little research and give it a try!